Welcome to the Chasolen Education & Research Center. I developed the Center in 2007 as the result of my perceived need to discuss and pass on the education, knowledge and experience I have accumulated in my 25 years of as a student, clinician and educator. I am a clinical dentist with a specialty degree in Prosthodontics and formal fellowship training in Implant Prosthodontics. The Center provides dentists and their teams with evidence and clinical based information and interaction that allows the opportunity for the dental practitioner to achieve the highest level of treatment outcome for each individual patient in their practice. In the early 2000s, I noticed that many of the lecture circuit gurus were no longer primarily making their living at the chair. With that absence comes a disconnect from the issues that face clinical dentists every day. My perspective is both clinical and academic. I enjoy a busy clinical practice of 170 days per year at the chair experiencing today’s real complex clinical issues. I have reconstructed over 1000 full arches on the most involved perio/restorative/implant/tmd patients in a multidisciplinary setting. I also enjoy a part-time faculty position at the University of Florida working with the Residents in the Graduate Prosthodontic Residency program. I train the private practice dentist in a variety of settings including hotel-based seminars, in-office smaller group workshops, on-line web-based formats and one-on-one interaction. I wanted to share my experiences with the profession: the principles and approaches that have allowed me to help thousands of patients, the experiences that have led to occasional compromised outcomes, and what I have learned from those experiences. The reality of the significance of occlusal philosophies and their impact on short term and long term treatment outcomes. 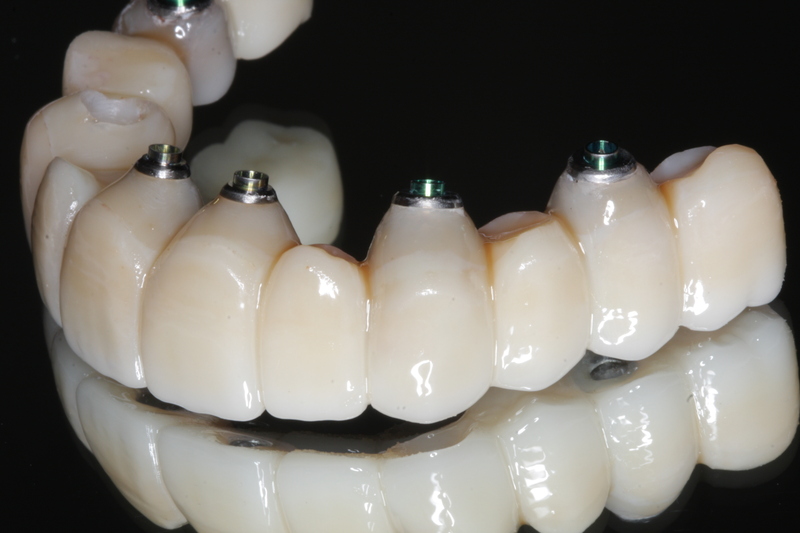 Guided implant prosthetics and the gammit of immediate loading. My experience with restorative materials and long term prognosis. Adhesive dentistry and the foundation that adhesive cores provide for all future restorative and cosmetic dentistry. Telescopic periodontal/prosthetic reconstruction when implant reconstruction is not an option. The management of parafunction post treatment. The integration of instrumentation and technology into simple and complex dentistry. And all of the components, including interpersonal patient management, that are needed in today’s restorative dental practice to make a successful dental practitioner and a successful treatment outcome. The goal of my education center is to educate dentists and their teams so that they may help their patients and provide appropriate evaluation, diagnosis, planning, treatment and management the FIRST TIME. Much of my clinical dental practice is treating the unfortunate referred patient that has already been unsuccessfully treated elsewhere several times. This just shouldn’t and doesn’t have to happen. My personal mission through the education center is to influence as many dentists as possible, in a positive fashion, and help them incorporate principles of restorative dentistry that will enhance their lives and their patients lives. "Dr. Chasolen and Bill provide a world class CE experience in a world class environment. You will leave with countless..."